Meet Prince, a wonderful, majestic, snow white half draft horse. He is stout and solid, but not too tall. Prince is young, only eight-years-old, and was a carriage horse before coming to the Hanson Center. He loves to put his huge head on your shoulder or gallop around the paddock with all of his equine friends. 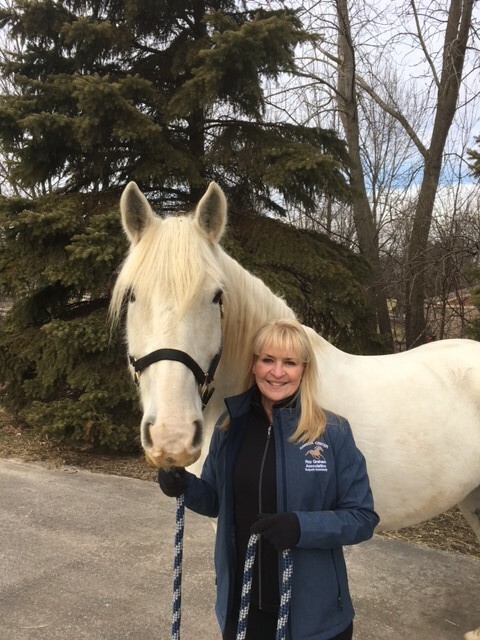 This amazing horse lives at the Hanson Center barn, a Ray Graham Association (RGA) site tucked into the serene Burr Ridge community. The Hanson Center barn is home to one of RGA’s most revered programs, the Therapeutic Horsemanship Program. This program provides opportunities for children and adults with disabilities to experience the enjoyment and therapeutic benefits of horseback riding. The cost to maintain the grounds and ensure that the horses receive high-quality care is enormous, costing RGA hundreds of thousands of dollars each year. In order to supplement this cost, RGA has launched the Adopt-a-Horse effort, through which supporters of the horse community, RGA and the Hanson Center have the opportunity to “adopt” the featured horse of the month, as well as support other annual needs. Mr. and Mrs. Frederick and Karen Henderson, of Hinsdale, have graciously sponsored January’s Horse of the Month, Prince. Thanks to the amazing generosity of the Hendersons, Prince will enjoy the high-quality care he deserves.